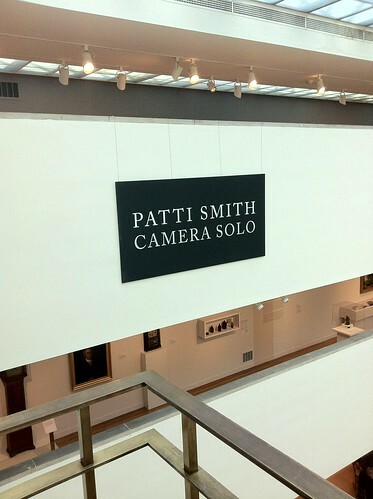 I traveled to Hartford last weekend to see Patti Smith’s first museum photography exhibit, titled Camera Solo at the Wadsworth Atheneum. It’s a small but dense exhibit, three rooms of photographs and artifacts. It took about an hour and a half to go through everything, which included time to watch a 7-minute 35mm short that was part of the exhibit, and to revisit favorites at the end. The exhibit is accompanied by an audio tour that you can access from your cellphone, by dialing an 800 number and punching in an exhibit number. Patti herself recorded the narration, which was just fantastic. It definitely added another dimension to my experience of the exhibit, and I appreciated the low-tech but extremely effective method. (You can hear the narration in the museum’s account on Soundcloud!) If you had the narration and the exhibit catalog (which I had received as part of a charity grab bag I purchased during the New Year’s Eve shows, you would be able to experience about 50% of the exhibit. Of course, seeing everything in person is always so different than leafing through a book, as any art history student knows. The light in the room, your physical proximity, distance, space, all of this combines to make the experience of being there with the art so very worthwhile. Various artifacts from Patti’s collection, some of which were photographed in the exhibit, appeared in vitrines throughout, accompanied by handwritten cards explaining the items. I appreciated the natural but also thoughtful grouping of items, and was most touched by the space dedicated to her thoughts and photographs and work about Rimbaud. That room also featured one of her three-dimensional pieces, a version of the litter that carried the injured Rimbaud through the Ethiopian desert. You saw an initial sketch of the litter, a miniature prototype, and then the fully realized piece. There were also items from her trip to the Rimbaud Museum in Ardennes (which readers of Just Kids will remember). As a fan I am continually inspired by her hard work and dedication, and how she never pretends that anything just happens (although she makes a fair allowance for magic or the divine, which is different) and never hides her process and the sweat and effort it takes to produce it. The exhibit is in Hartford until mid-February; combine your trip there with a visit and tour of the Mark Twain House (which was absolutely amazing, and well worth the time) and you have a nice day trip.